" Money$uit 31and all associated Intellectual Property is owned solely by Money$uit Industries, LLC., and is used with permission by the owner on this website." Money$uit 31 is a casino game where the winning objectives are based on the players’ card point values based on blackjack scoring and the number of cards with identical suits in a three card hand. The objective of Money$uit 31 is to have a winning three card hand by combining a point value of 17 or higher with up to three suited cards. The dealer does not play. The point values are scored as in blackjack: 10-J-Q-K are worth 10, Aces are always 11, and the remaining cards are worth their face value. Only suited cards are tallied to determine the point totals with one exception: 3 of a kind (trips) can be totaled for a potential win. This casino game is played with a standard 52 card deck on a blackjack like table with seats for up to seven players and a house dealer. Players must first make an ante wager. The Money $uit is then determined where the dealer shakes two custom die in a shaker located in the center of the table. 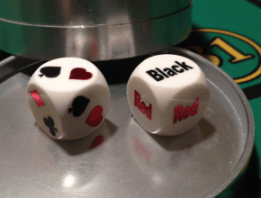 One die will show Red or Black on each side and the other will be display a Heart/Spade and Diamond/Club as shown below. The face up displays after the roll determine the Money $uit. For example, if one die displays Red and the other shows Diamond/Club, the Money $uit is Diamonds. In none-dice jurisdictions, the Money $uit will remain constant. An optional Natural 31 wager can also be made where the win is determined by the value of the initial three cards dealt. Fold - Players forfeit the ante and optional bets. Play – Make a Play wager equal to the ante. If a player makes the play bet, a fourth card is placed face down in the Draw position. This gives the player a chance to improve his or her hand. Cards are then turned face up by the dealer to determine win/loss. As per the aforementioned, only suited cards are totaled with the exception of 3 of a Kind (Trips), which is the only non-suited hand that pays. If a player has a winning hand composed of the Money$uit, as determined by the Money$uit card, the winning amounts are multiplied according to the Money $uit Multiplier (M$M) on the pay tables. The following pay tables are the winning amounts for the points shown on the Play wager. The Ante bet always pays 1 to 1 except for Any 17 on the base game, where the bet pushes. The house edge for the base game is about 3.04%. The edge for the optional Natural 31 bonus bet is about 5.22%. 3 unsuited cards, each with a value of 7 or higher. 2 opposing suits with a value of 9 or higher. A pair of 7’s or better. A pair of 2’s – 6’s holding a suited 10 or better. 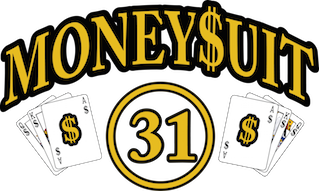 For more information about Money$uit 31 and two more related games, 31 Classic and Match 31, visit www.moneysuit31.com, where you can practice some free play on the game demos’.